SUBJECT: This is a beautiful World War. 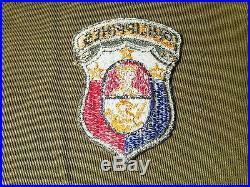 US Army Philippine General Staff Patch. SIZE: About 2 1/2 x 3-3/8 in diameter. CONSTRUCTION/MATERIALS: Cotton embroidery thread on cotton. ATTACHMENT: To be sewn onto garment. CONDITION: Very minor wear and aging, mostly to edges. GUARANTEE: As with all my items, this piece is guaranteed original. 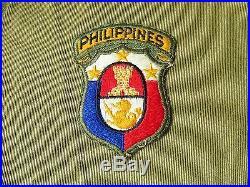 The item "US Army Philippine General Staff Patch" is in sale since Sunday, September 28, 2014. This item is in the category "Collectibles\Militaria\WW II (1939-45)\Original Period Items\United States\Patches". The seller is "steviewonder2002" and is located in Santa Rosa, California. This item can be shipped worldwide.